On Saturday we provided the wedding transport for Joanna & Jordan. Joanna fell in love with our Regent Landaulet In Black & Ivory With Wired Wheels at one of the Moor Hall Hotel & Spa open days, to the extent she viewed the car twice on the same day! Firstly with her Mother and then with Jordan and her Father. Our day started in glorious sunshine and blue sky in Kings Norton at the Groomsmen’s house; we picked up Jordan along with his 3 Best Men and Usher and made the short journey to St Nicolas’ Church on The Green in Kings Norton. Our next port of call was to pick up Joanna’s 5 Bridesmaid’s & Mother, the final journey, prior to the wedding, was of course for Joanna and her Father. We arrived at 11:50am and Joanna was greeted by many well wishers outside church before she walked down the aisle. Following the service Joanne & Jordan had photos with friends on The Green in front of the church, the highlight of the photos was the throwing of Joanna’s bouquet and the subsequent reaction by the boyfriend of the “catcher”!!! Guests made their way from the church over to Moor Hall Hotel & Spa in Sutton Coldfield, some were a little later than others as a few chose to have a “quick” drink at the Bulls Head opposite the church before departure! Our journey over to Moor Hall & Spa took us 40 minutes and was an absolute joy as we drove through Birmingham in the blazing sunshine, with the roof down of course! Upon arrival at Moor Hall Hotel & Spa they had a few photos with the car in front of the hotel before we made our way round to The Charter Suite to continue their celebrations. Joanna & Jordan are a great couple and it was an absolute pleasure to be involved in their wedding day, we wish them all the very best for the future. Just to add; Sally Wood (www.sallywoodphoto.co.uk) photographed Joanna & Jordan’s wedding, she was brilliant to work with and comes very highly recommend by Love Wedding Cars. On Thursday 17th April 2014 we provided the wedding car for Sinead & Matthew. 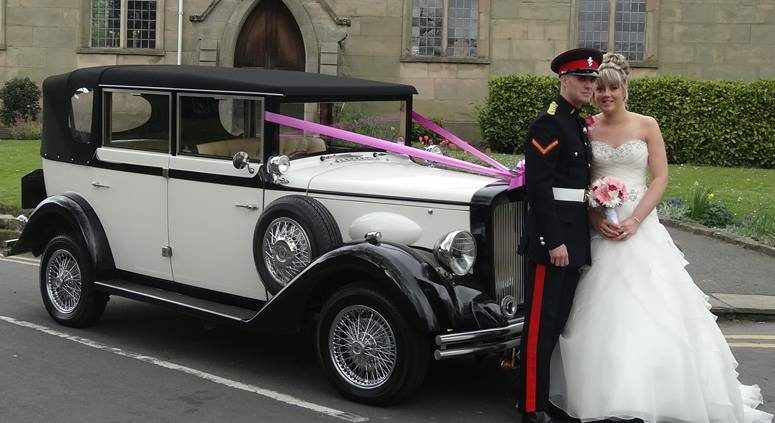 We met Sinead and her Mother at The Castle Hotel in Tamworth wedding fayre in February, where Sinead fell in love with our Regent Landaulet In Black & Ivory With Wired Wheels, as did her Mother! Their wedding day started with us picking up Sinead’s 4 Bridemaids, Mother and Page Boy from The Castle Hotel, we dropped them at Holy Trinity Church in Wilnecote then returned to The Castle Hotel. We then took Sinead and her Father. The service lasted in the region of 40 minutes, after the service they had their group photos on the grass bank opposite the Church as well as close family photos outside church. Following the photos we served Sinead & Matthew champagne before the journey to The Castle Hotel, and their wedding reception. Sinead & Matthew are a lovely couple and wish them many happy years together. On Friday 7th March 2014 we provided the wedding car for Gemma & Lee. They first contacted us via our website www.loveweddingcars.co.uk, they then came to our unit and viewed our cars where they chose our Regent Landaulet In Black & Ivory With Wired Wheels. Their wedding day was sunny and reasonably warm, which made a change from the recent wet weather. We picked Gemma and her Father up from Burntwood and made the short journey to Lichfield Registry Office. Following Gemma & Lee’s short ceremony they had lots of photos with friends and family in the superb Beacon Park. We then set of for Sutton Coldfield and The Boathouse Restaurant which is beautifully positioned in the heart of Sutton Park, overlooking Bracebridge Pool. I was so pleased the weather remained good throughout and it was great to be able to drop the roof for the journey through Sutton Park. It was an absolute pleasure to be involved in Gemma & Lee’s wedding day and we wish them all the very best for the future.